Dijon FCO midfielder Kwon Chang-hoon has been dropped from South Korea's preliminary World Cup roster due to injury, the national football governing body said Monday. The Korea Football Association said Kwon has been excluded from South Korea's 28-man roster for the 2018 FIFA World Cup and will not join the national team. The KFA added it will not call up Kwon's replacement and the national team will train with 27 players at the National Football Center in Paju, Gyeonggi Province, later Monday. 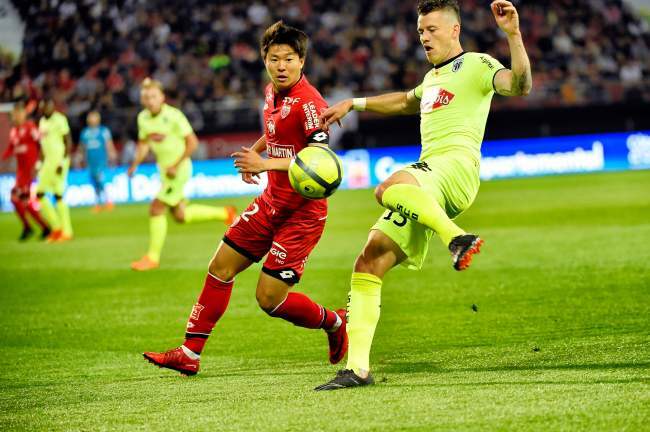 Kwon started as a forward in Dijon's French Ligue 1 match against Angers at Stade Gaston-Gerard in Dijon, France, on Saturday, but he was forced to leave the pitch in the 76th minute due to injury. Although Kwon's exact injury status has not been revealed, he appeared to have a ruptured Achilles tendon and will likely be sidelined for months, according to French media. Kwon, 23, is considered a key attacking player for South Korea due to his impressive season in France. The former Suwon Samsung Bluewings player, who joined Dijon in January 2017, scored 11 goals in 34 matches in France this season. With South Korea, Kwon has four goals in 16 appearances. Kwon's injury will deepen concerns for South Korean head coach Shin Tae-yong. Shin's side had already lost center back Kim Min-jae and midfielder Yeom Ki-hun, while left back Kim Jin-su is doubtful for upcoming matches due to injuries. South Korea will confirm their final roster of 23 players after they play two friendly matches at home next week. South Korea will face Honduras on Monday and take on Bosnia and Herzegovina on June 1.